• Large 8 digit clear angled display. • Solar powered with battery back-up. • Tax feature - ideal for VAT calculations. • Mark-up key for profit calculations. • Extra large commonly used keys. This fast and efficient dual powered calculator from Aurora is ideal for general, everyday use and allows you to take care of simple calculations with ease. 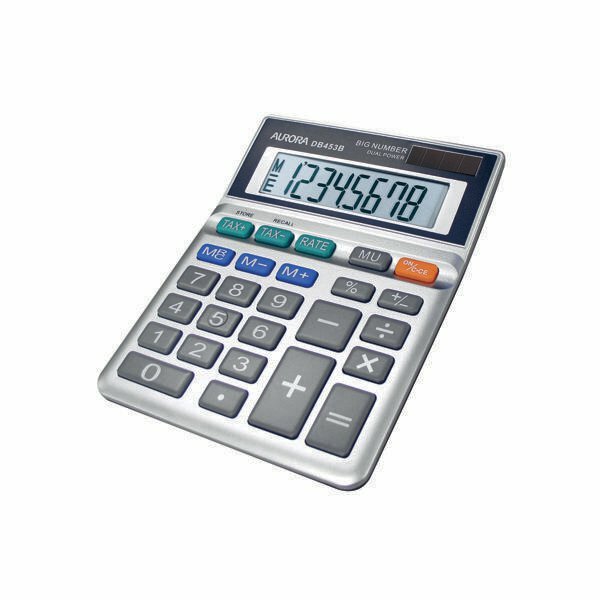 Featuring a wide, fixed angle display screen and large, easy to use number keys, the calculator offers fantastic usability. It also comes with three separate memory keys for longer calculations as well as a mark up/ mark down button for added flexibility.